Dri-Scope Aid®2 Assists in the Drying of the Internal Channels of an Endoscope. 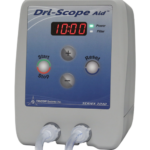 TRICOR-Systems Inc. is excited to announce the new Dri-Scope Aid®2 with dual timer. The dual timer will allow the operator to hook up two endoscopes (Olympus, Pentax, and Fuji) with independent start and stop times. The individual timers will help with the flow and turnaround time in the reprocessing room. 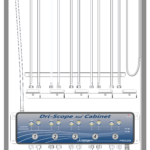 The Dri-Scope Aid®2 unit features a daily disposable tubing assembly, individual scope connectors and is capable of processing two endoscopes at once. The scopes are simply attached to the daily tubing assembly via the connectors, the required time is set, and the start button pressed to initiate a continuous flow of HEPA-filtered air through the scope(s), freeing the technician for other duties. Timing can be set between 1 and 99 minutes using the unit’s digital display and touch pad controls. The Dri-Scope Aid® unit is compact (8.2 inches tall by 6.1 inches wide and 6.5 inches deep), and weighs only 4.5 pounds. It is designed for countertop, wall mount or pole mount use. 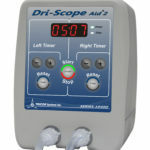 For more information on Dri-Scope Aid®2, call 508-423-3223, e-mail sales@driscope.com and visit www.driscope.com. TRICOR is a small, progressive business actively involved for 40 years in the design, development, and manufacture of military, aerospace and medical electronic equipment / instrumentation, as well as various other products including software. TRICOR’s ability for a quick turn-around from product inception to delivery is what sets us apart from our competitors. TRICOR customers include many Fortune 500 companies within the aerospace, defense and medical industries. TRICOR’s current quality registrations include: ISO13485:2003, ISO9001:2008, and AS9100C.